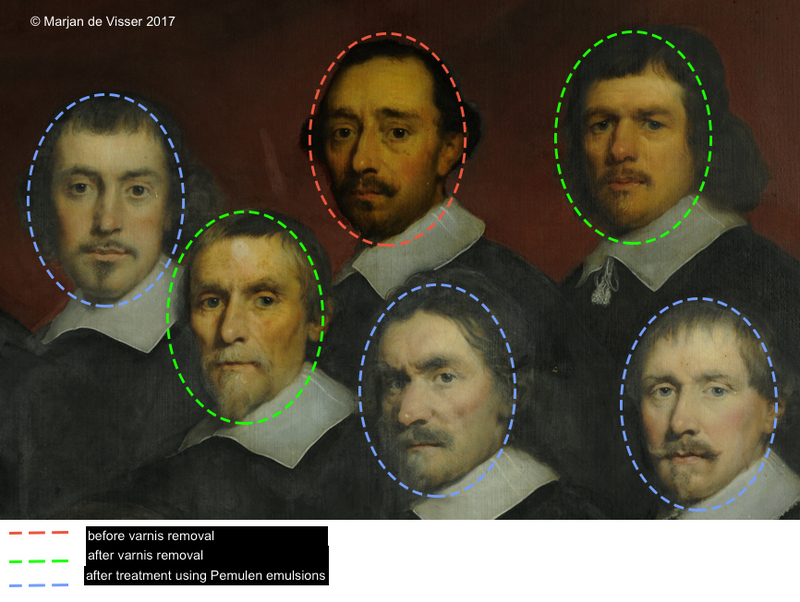 Pemulen emulsions for the removal of overpaint, discoloured remains of lining adhesive, remnants of older varnish layers on a 17th-century group portrait. A poster about Pemulen emulsions in conservation, written by Marjan de Visser and Lucy Odlin part of the pre-printed papers and posters which were then presented at the Gels in Conservation conference, London 16 – 18 October 2017, plus an Appendix by Richard Wolbers ‘Terminology and Properties of Selected Gels’. The opening was carried out by Richard Wolbers him self, see video by IAP. 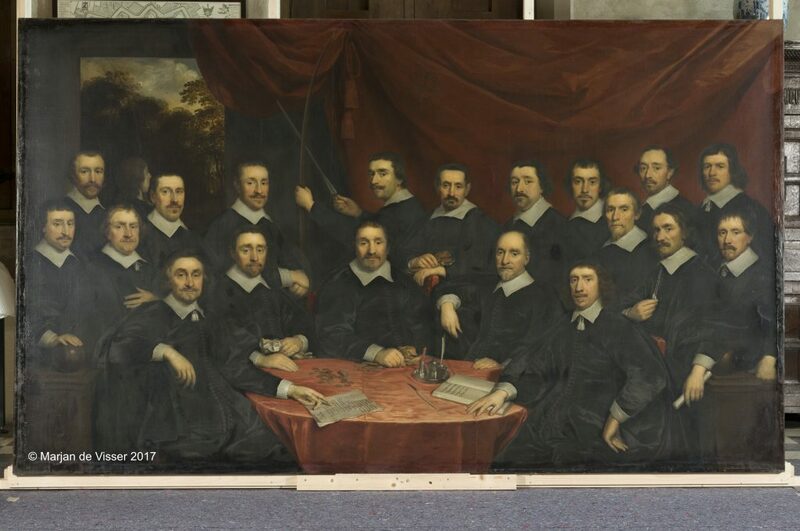 This paper presents a case study of the application of aqueous gel-based cleaning systems using tailored Pemulen emulsions based on the Modular Cleaning Program (MCP) developed by Chris Stavroudis.1 Their use is discussed in the context of the full conservation treatment of a large-scale group portrait The Archers’ Guild of Middelburg, 1650, by Cornelius Jonson van Ceulen (1593‒1661).2 The painting (Fig. 1) depicts the Confraternity of St Sebastian and is displayed in Middelburg town hall in the Netherlands. Notably, The Archers’ Guild maintains a direct link with the current Confraternity of St Sebastian. Founded in 1217, the Confraternity remains active today, with 24 current members. These members, passionate about their painting, were the driving force behind the conservation project. A key stipulation was that the project should be publicly accessible for the duration of the treatment. 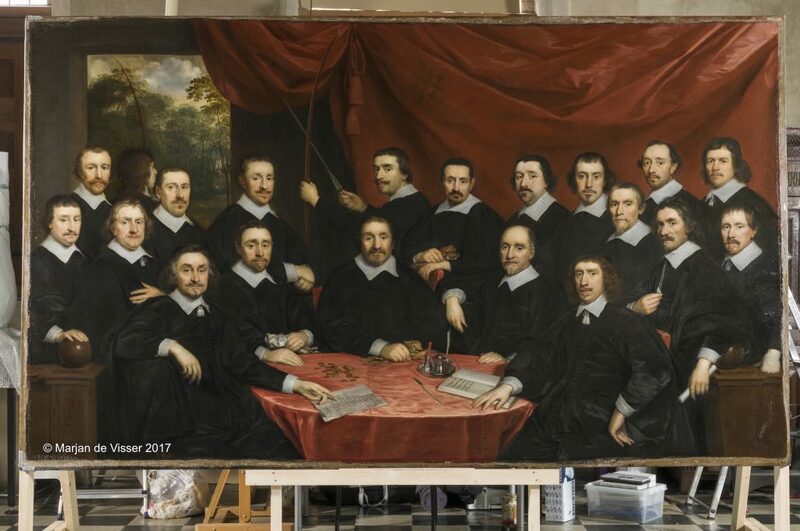 Cornelius Jonson van Ceulen found success in London as court painter to Charles I, but following political unrest and dwindling commissions he returned to his native Netherlands in the 1640s, becoming a member of the Painter’s Guild in Middelburg where this painting was executed. Set against a red-brown curtain, the members of the Confraternity surround a table covered with a red tablecloth, on which various official items are placed. In the upper left corner there is an aperture with a view to the trees: the turned head of the concierge, his poised bow, and the archer’s target are just visible. The curtain displays the coat of arms of the Archers’ Guild, and the open book on the table details the names of the board members depicted. In the lower left corner of the tablecloth van Ceulen’s invoice can be made out, bearing his signature and the date ‘1650’. The large composition was painted on a single piece of herringbone weave canvas, and had undergone at least two wax-resin linings, in the 19th and 20th centuries.3 The original tacking margins were no longer present, and the current tacking margins and front turnover edge were saturated with a thick sticky layer of yellow-brown wax-resin lining adhesive. Two distinct types of filling and retouching provided further evidence of at least two major restorations in the past, increasing the likelihood of varnish and adhesive residues having been deposited on the surface over time. Throughout the composition, the degraded natural resin varnish layer had become opaque and yellowed, dark residues had accumulated in the recesses of the canvas weave and impasto, and together with a dirty nicotine-like layer they were obscuring the image beneath. The conservation treatment was undertaken in a public space. Free solvent use was minimized and a carbon filter mobile extraction unit was employed for the health and safety of both conservators and the public. Pemulen emulsions gels were a suitable option at this point: they are non-volatile and water-based, can be precisely tailored to the removal of a particular soil, and their rheological properties can prevent penetration into the paint film beyond the targeted layer. However initial dirt and varnish removal was carried out with a buffered solution and free solvents because step-by-step cleaning provided a better understanding of the surface coatings covering the paint film. The degraded varnish and surface coatings masked widespread discoloured restoration which became more apparent during initial varnish removal using free solvents, particularly throughout the heavily abraded black costumes. The sky was overpainted with an opaque blue layer (Fig. 2), which covered a now ochre-coloured sky. In addition, the discoloured remains of lining adhesive and remnants of older varnish layers remained across the painted surface, emphasized by the herringbone weave (Fig. 3). In lighter passages such as the collars and faces this was considerably disturbing to the image. The solubility of the overpaint, remains of lining adhesive and remnants of older varnish layers was tested using Pemulen emulsions tailored to different areas following the MCP ingredients and methods. The mixtures were made up of 1 part Pemulen TR-2 to 1 part water-based mixtures (v/v), described in more detail below. Water-based mixtures were made up of 5 parts in total (Table 1). All solutions were cleared using petroleum ether. Cleaning tests were evaluated empirically in visible and ultraviolet (UV) light and using a digital microscope, taking into account the balance between effectiveness, control and length of application of the different emulsion mixtures. Pemulen emulsions were applied using white brushes and agitated for up to 30 seconds, until the clear gel showed signs of discolouration, and removed with tissue and cotton swabs. This method was repeated until all residues were removed. Starting with mixtures 1 and 2 and working across Table 1, the two mixtures were then compared and the most effective of these was then compared with the next mixture. All stages of the systematic removal of surface coatings are summarized below. Surface dirt removal: Nicotine-like surface dirt was successfully removed using an adjusted water solution buffered to pH 8.5 (bicine +NH4OH), 4.0 mS, cleared with adjusted water pH 8.5, 1.0 mS. A raised pH was chosen as a first step to break down the degraded natural resin varnish. Varnish removal: The varnish was removed using free solvent mixtures of isopropanol and isooctane, and cotton swabs. Overpaint removal: Black overpaint in the costumes was removed using Pemulen emulsions gels 4 and 5 depending on the area. Blue overpaint in the sky was removed using Pemulen emulsions gel 6. Discoloured remains of lining adhesive and remnants of older varnish removal: Residues were removed using Pemulen emulsions gels 2 and 4. Pemulen emulsions at a raised pH of 8.5 and a 10–20% benzyl alcohol content (emulsions 2, 4 and 5) successfully removed the overpaint and discoloured residual material. The blue overpaint in the sky, most probably a lead white oil-based paint, required emulsion mixture 6, containing the lead chelator EDTA and the surfactant deoxycholic acid. 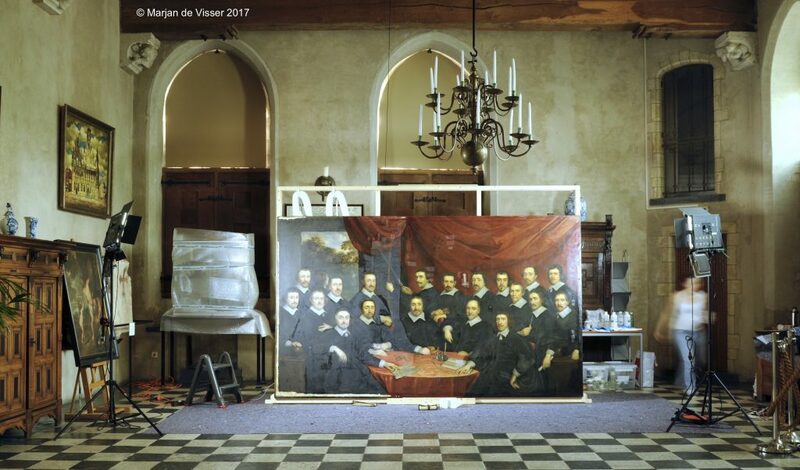 The conservation of The Archers’ Guild of Middelburg by Cornelius Jonson van Ceulen posed specific challenges related to the public location of the treatment. 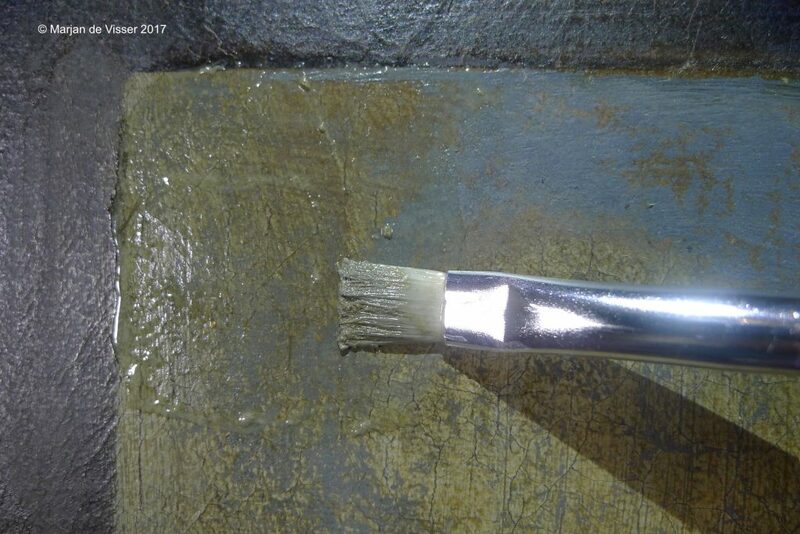 Pemulen emulsions gel system based on the MCP proved to be a safe and effective method to remove overpaint, remains of lining adhesive and remnants of older varnish layers from a 17th-century painting. For an initial bibliography see www.getty.edu/conservation/publications_resources/teaching/caps_modular_cleaning.pdf. MCP software can be downloaded from cool.conservation-us.org/byauth/stavroudis/mcp/. For an introduction to aqueous gel cleaning methods see also Stavroudis and Wolbers 2012. The name ‘Cornelius Jonson van Ceulen’ is how the artist referred to himself when he moved to the Netherlands, rather than ‘Cornelius Johnson’ as he is known in the UK. In the 19th century a lining was also carried out to repair tears in both lower corners, and more recently in the mid-20th century, to address a large tear in the centre of the composition. Stavroudis, C. and Wolbers, R. 2012. ‘Aqueous methods for the cleaning of paintings’, in J.H. Stoner and R. Rushfield (eds), The Conservation of Easel Paintings. London and New York: Routledge, 500‒523.